Lock in a great price for Boutique Hotel Minzifa – rated 9.2 by recent guests! Nice hotel. 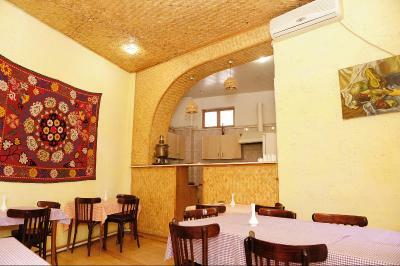 Excellent service, near the city center but still located in the old city a location with a nice atmosphere. Very supportable staff and most of them speak good English. Cozy courtyard and nice breakfast. 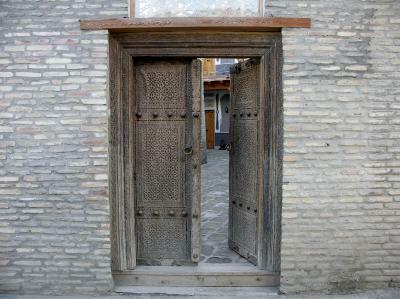 Easy access to the center of old Bukhara. I love this charming place. 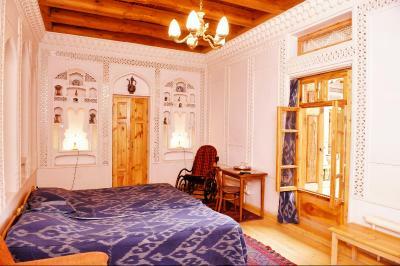 The rooms are well decorated and comfortable, the location is excellent and the staff is wonderful. Our booking was changed to a different location when we arrived as the owner has several hotels in the area, so we weren't getting exactly what we had planned. The hotel we stayed was very close by and looked very similar. The staff were very friendly and helpful when we needed to check out early in the morning. Great Hotel in the center of the old city. very friendly stuff and nice rooms. Great breakfast in the country yard. Very nice interieur and very kind staff,tasty breakfast and location close to main square,good water pressure and hot water-but-wifi in rooms is a mess! 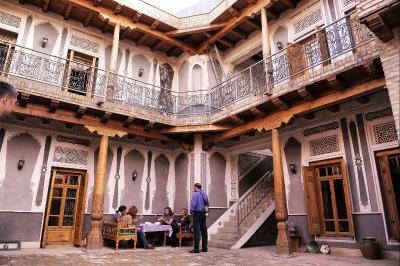 Beautiful traditional Bukhara house. Peaceful and relaxing. Wonderful staff. Boutique Hotel Minzifa This rating is a reflection of how the property compares to the industry standard when it comes to price, facilities and services available. It's based on a self-evaluation by the property. Use this rating to help choose your stay! Free Wi-Fi and a 24-hour reception are available at the centrally located Boutique Hotel Minzifa. 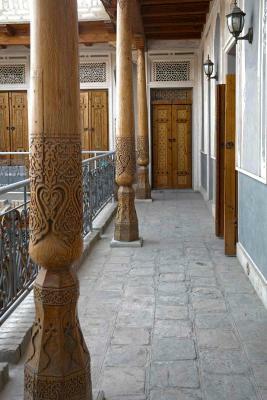 Located in Old Bukhara, the traditionally decorated hotel is 500 feet from Lyabi-Hauz Architectural Complex. 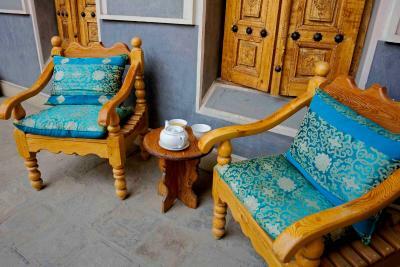 Colorful, eastern-inspired rooms at Hotel Minzifa feature traditional Uzbek embroidery. They all include a flat-screen TV, refrigerator, and air conditioning. Only 3.1 mi from the airport, the hotel can arrange an airport shuttle for an extra fee. When would you like to stay at Boutique Hotel Minzifa? 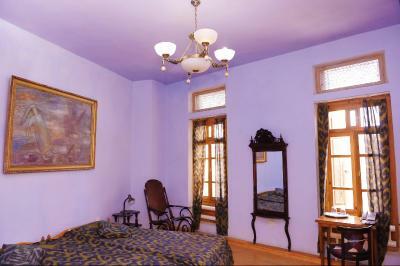 Colorful room includes a flat-screen TV and a private bathroom with slippers. Private parking is available on site (reservation is needed) and costs USD 2.50 per day. 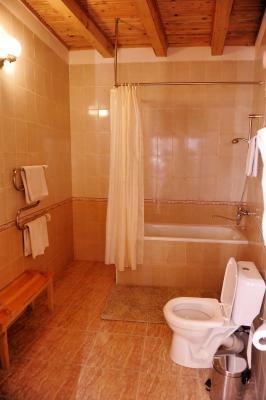 Large colorful room includes a flat-screen TV and private bathroom with slippers. The room additionally has a sofa bed. 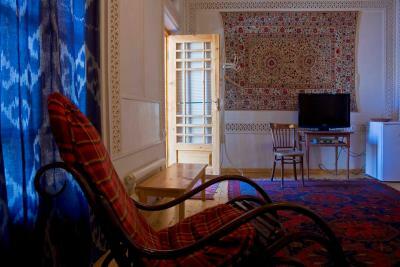 Orient-style room with a flat-screen TV and a private bathroom with slippers. House Rules Boutique Hotel Minzifa takes special requests – add in the next step! A deposit via bank wire (20% of the whole amount) is required to secure your reservation and is due 60 days prior the arrival. The hotel will contact you with instructions after booking. Guests who have booked 7 days prior the arrival do not pay the deposit. A wonderful hotel choice in a very convenient location. 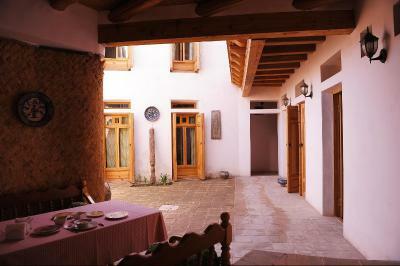 Nice rooms, location convenient to the historic center, and helpful staff. Like all Uzbeks, the staff members here are authentically kind and welcoming. They gave great suggestions for touring, shopping, and restaurants. Their English and customer service skills are outstanding. I would definitely stay in this hotel again, and recommend it highly. The staff was really friendly and helpful. They told us about the history of the city and the country, they adapted to meet all our needs (early check in or check out, breakfast...). Breakfast nice in a beautiful yard, rooms ok. Overall, a pleasant stay. Minzifa was a dream! We arrived early in the morning (around 7am) but staff were super accommodating, and let us check into our room early for a small fee. The decor is stunning, and our room was spacious with a huge bathroom. Breakfast was amazing — so much variety and lots of fresh fruit and good coffee, which was refreshing. Everyone who worked at Minzifa was incredibly helpful, too — they helped us to organise train tickets to Samarkand on short notice, and brought coffee up to our room, and so on. Only downsides: wi-fi is a bit spotty, and you can’t pay for your stay with card. Other than that, perfect. Great ambiente, excellent breakfast individually served outside in the atrium, friendly staff, nice rooms, good beds, close to the center ! The small Intimate feel. 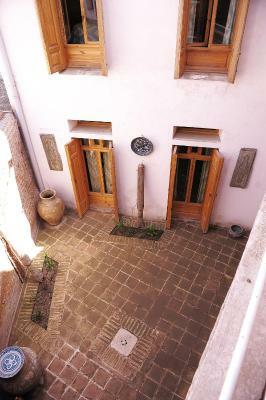 The quiet courtyards. Friendly and helpful staff and the courtyard breakfast. Also very good WiFi. Hotel didn't have a pool which would have been welcomed given how hot it was.Water stopped a couple of times during our stay but it was quickly fixed. Great location near all the things to see.Cool quirky room and friendly staff.Very pretty building.